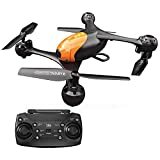 Hubsan H501S Drone Review 2019 – is the Hubsan H501S quadcopter worth the money? Review of features, pricing, flight duration, battery, camera and more. Hubsan has progressively expanded its drone range with improvements to flight capabilities and design quality. Laying your hands on the H501S is an awesome experience. The product is a solid quadcopter made of a sturdy material, including metal and plastic. This GPS-equipped drone is controlled by a smartphone or a dedicated remote control and has some of the best flight characteristics of the Hubsan stable, including waypoint-guided flight modes and return functions. The Hubsan H501S Drone is equipped with GPS, which allows it to handle a variety of functions, including Return to Home (RTH), Orbit and Follow Me modes. For these functions, the drone uses the radio remote control as a reference. In the event of failure of the latter, the quadrotor returns to the coordinates where it was turned on. The radio control is the real gem of the H501 drone. The H906A model controller is equipped with a three-inch screen. 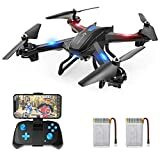 It is equipped with two adjustable antennas, one for the 2.4 GHz frequency for flight controls and one for the first person view (FPV), which uses 5.8 GHz. The screen is equipped with a concealed hood that also acts as a protective cover. The H906A remote control features a 2.5mm video output feature for connecting external monitors or glasses. The unit is powered by eight AA batteries but it is advisable to switch to a three-cell LiPo battery. The commands are configurable via software and you can switch to all known flight modes based on your piloting experience. The geographical coordinates shown on the screen, allow you to find the drone in case it is lost due to a crash or the depletion of the battery power. Simply enter the coordinates on Google Maps to get the last position of your Hubsan H501 Drone. The drone is powered by simple and inexpensive two-cell LiPo batteries that come with a proprietary jack. It is advisable to use non-original batteries because the supplied one has a discharge current of 10c, which is insufficient for this model. When the voltage approaches 7 volts, the battery cannot handle the operation of the drone. Hence, the need to change the connector with a common standard. The camera, which is located on the front can capture quality photos and HD videos. The quality of the photos is more than decent. 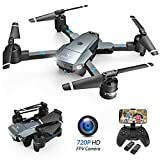 However, this drone comes with no gimbal or any other form of stabilization. The quality of the shot is optimal when the device is stationary with the light behind it. The majority of user reviews posted online, including on Amazon show that customers appreciate the Hubsan H501S’s features and performance. The remote controller is singled out as the best feature on this drone. Overall, customers agree that the Hubsan H501S Drone provides a good price to quality ratio. The Hubsan H501S’s radio remote control undoubtedly deserves accolades. It is a true masterpiece with a professional and gritty appearance. At the center, you find the heart of the controller: a color LCD screen on which you can receive FPV video transmission in real time. It also features the telemetry with all the flight parameters, the GPS position, the state of battery charge and other useful parameters needed before and during the flight. On the sides of the screen, you will find two levers to control the drone, which can be set in one of two modes. By default, the radio control is set to Mode 2, which is particularly ideal for most operations. On the base of the radio control, you will find a micro USB port to update the firmware and a video output feature to connect external goggles or screens. On the other hand, the Hubsan H109S X4 Pro is one of the best drones in the Hubsan family. It can handle 1080p video capture, live video streaming, GPS flight with return and tracking features. This quadcopter is a reasonable competitor of the Phantom 3. The MJX Bugs 3 Mini has a relatively short flight time. For the Hubsan H501S drone, the flight time with the included battery is around 15-20 minutes depending on usage. The Bugs 3 Mini drone comes without a camera. This is also an advantage in some ways because it has allowed MJX to reduce costs and not to constrain the pilots. The devices allow users to attach their own action cameras. The initial setup is simple. Once the drone and the remote control have been switched on, they will be automatically paired. You can then follow the instructions on the radio control screen. As such, it is necessary to leave the drone stationary to allow it to adjust the gyroscope and rotate horizontally and vertically to set the compasses on board. Even if you can fly in headless mode, the advice is to rely on flashing green and pink LEDs on the legs of the arms to understand the direction of flight. These are bright LEDs that are clearly visible from afar, especially at night. As usual, especially for beginners, the advice is to start by disabling the Expert mode, then eventually configure it when you have gained sufficient confidence. When piloted in GPS assisted mode, the drone can reach a speed of 5 miles per second (18km/h), disabling the GPS allows you to push it up to 23 m/s (82 km/h). However, it is not advisable to reach this limit, you will easily risk losing control and crashing the drone. The Hubsan H501S Drone is a really good, economical drone. Being an entry-level model, it is ideal for anyone exploring the world of drones for the first time.